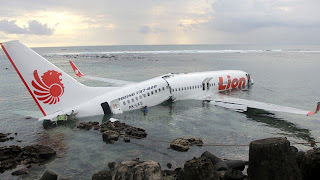 13 April 2013; Lion Air; 737-800; PK-LKS; flight 904; Bali, Indonesia: The aircraft was on a scheduled domestic flight from Bandung, Indonesia to Bali, arriving during a rain storm. The aircraft landed in shallow water short of the runway during final approach. Although the aircraft had a break in the fuselage just behind the wings, none of the 101 passengers or seven crew members were killed. The FAA would not consider this event a ditching because it did not involve a planned, controlled contact with water where the passengers and crew had time to prepare for the event. Also, AirSafe.com puts a further restriction on its ditching definition by defining a ditching event where the crew makes an intentional water landing where the water is deep enough that if the aircraft sinks, some or all of the occupants would have to evacuate the aircraft to avoid drowning . AirSafe.com lists only four ditching events involving airline flights using large jet transports, the most recent being the 2009 accident where a US Airways A320 landed on the Hudson River in New York. The airline, which began operations in 2000, is based in Indonesia and is that nation's largest domestic air carrier. According to AirFleets.net, it has a fleet of about 95 aircraft, including over 80 of the latest models of the 737, the 737-800 and 737-900. 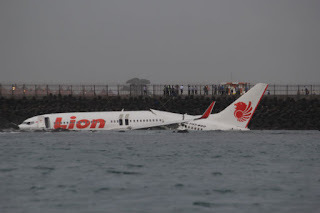 2 November 2010 - Lion Air 737-400 overran the runway on landing and the aircraft was substantially damaged, but none of the 169 passengers or six crew were injured. 9 March 2009 - Lion Air MD90 with 166 passengers or six crew on board was substantially damaged after a hard landing where the crew was able to keep the aircraft only partially on the runway. The aircraft was damaged beyond repair. 24 December 2006 - Lion Air 737-400 with 164 passengers or seven crew on board was substantially damaged, after a hard landing. The aircraft was damaged beyond repair. 4 March 2006 - Lion Air MD90 with 138 passengers or six crew on board was involved in a landing incident that resulted in damage to the nose landing gear and the forward part of the fuselage. 16 January 2002 - Lion Air 737-200 with 96 passengers and seven crew on board overran the runway after a rejected takeoff, hitting some trees several hundred meters beyond the end of the runway. The aircraft was damaged beyond repair. There were nine previous accidents involving a 737-800, including five crashes involving passenger fatalities. The first crash was a September 2006 midair collision involving a Gol Linhas Aéreas 737-800 in Brazil that killed all six crew members and 148 passengers, and the most recent was a July 2011 non-fatal landing accident involving a Caribbean Airlines airliner in Guyana that injured several passengers and crew members. 29 September 2006; Gol Linhas Aéreas 737-800; Flight 1907; near Peixoto de Azevedo, Brazil: The aircraft was on a scheduled domestic flight from Manaus to Brasilia when it had a midair collision in the area of São Félix do Xingu with an Embraer ERJ135 Legacy 600 executive jet operated by ExcelAire. The ExcelAire Legacy 600 jet had been on a flight from São José dos Campos to Manaus. After the collision, which damaged the left wing, left stabilizer, and left elevator of the executive jet, the crew of the damaged ExcelAire aircraft was able to land at a nearby military airfield at Cachimbo, Brazil. The 737 subsequently experienced an inflight breakup and crashed about 30 kilometers (19 miles) north of the Peixoto de Azevedo municipality. The Legacy 600 was on the first leg of a delivery flight to the US The 737 aircraft was also relatively new, having come into service with the airline less than three weeks before the crash. All six crew members and 148 passengers on the 737 were killed. The two crew members and five passengers on the Legacy 600 were not injured. 25 February 2009; Turkish Airlines 737-800; Flight 1951; Amsterdam, Netherlands: The aircraft, on a scheduled international flight from Istanbul, Turkey, to Amsterdam, Netherlands crashed in a field about a mile (1.6 km) short of the runway. Four crew members, including both pilots, were killed, as were at five of the 128 passengers. 25 January 2010; Ethiopian Airlines 737-800 (ET-ANB); Flight 409; near Beirut, LebanonThe aircraft was on a scheduled international flight from Beirut, Lebanon to Addis Ababa, Ethiopia, and crashed into the Mediterranean Sea shortly after takeoff. There were 82 passengers and eight crew members on board, all of whom were killed in the crash. 22 May 2010; Air India Express; 737-800; flight 812; Mangalore, India: The aircraft (VT-AXV) was on a scheduled international flight from Dubai, UAE, to Mangalore, India, arriving just after 6 a.m. local time. The aircraft landed on one of the runways at Mangalore airport, but was unable to stop on the runway. There were six crew members and 160 passengers and on board, including four infants. All six crew members, and 152 of the 160 passengers were killed. 30 July 2011; Caribbean Airlines; 737-800; flight BW523; Georgetown, Guyana: The aircraft (9Y-PBM) was on a scheduled international flight from Port of Spain, Trinidad, arriving at about 1:25 a.m. local time at Georgetown, Guyana. The flight had originated at New York's JFK airport. After landing, the aircraft departed the runway and broke into two large sections. While there were several serious injuries among the 156 passengers and six crew members, no one was killed in this crash. Reportedly, the aircraft narrowly missed rolling into 200-foot deep ravine.